Hedgehogs are in serious trouble. A recent survey has estimated that a quarter of our hedgehog population has been lost in the last 10 years. The decline is so alarming that hedgehogs were declared to be a priority conservation species in 2007 and estimated to be 10th on the list of the most endangered species in Britain. We don’t know exactly why hedgehog numbers are falling, but there are a number of factors involved, including more intensive agriculture (the loss of hedgerows and permanent grassland) and the use of pesticides which reduces the amount of prey available. In towns and villages, gardens have often become smaller and tidier, with fences that stop hedgehogs moving between gardens, which has led to hedgehog populations becoming isolated and more vulnerable. More new buildings are being constructed, leading to loss of habitat, and tens of thousands of hedgehogs are killed on the roads each year. Badgers are one of the hedgehog’s natural predators, and with badger populations increasing in the UK this makes it even harder for hedgehogs to survive. We have noticed fewer and fewer hedgehogs at Bosinver and indeed along local lanes and hedgerows. There is inevitably the odd one or two dead on the road but I haven’t seen a live one for several years, even though we have the ideal habitat here for our prickly friends. We thought we would become more proactive and set about creating some inviting spaces for hedgehogs to make their homes. Paul has constructed some simple pallet houses, one on top of the other so we can cover and disguise them whilst maintaining a hidey hole stretching a long way back to deter predators. Our hedgehog house is in the vegetable garden, close by so we can feed the hedgehogs with dog or cat food or dried hedgehog food while they get used to living in the wild and foraging for themselves. 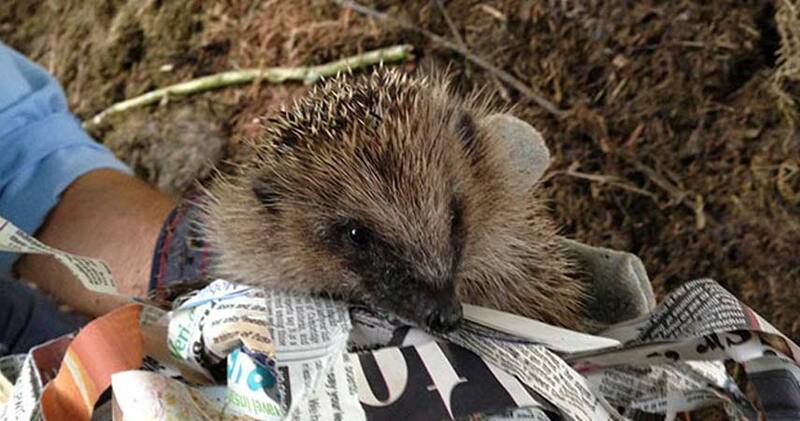 I recently came across our local rescue centre on Facebook, Prickles and Paws, who are based in Cubert, near Newquay. I contacted them and visited to collect Ronnie, an older male who had been injured by a strimmer and Joy, a young female who had been rescued as a hoglet and reared by hand. My grandson Sam came with me to fetch them and I was amazed to arrive at a suburban house with a back garden and shed devoted to hutches and runs of various sizes all containing hedgehogs. Some of the hedgehogs in the shed are very young or poorly and their cages had hospital style charts detailing their feeding regime and medicine administration – a real hedgehog hospital! Ann and her daughter have been rearing sick injured or orphaned hedgehogs for several years and it has become a full time job. Rescue centres are few and far between so the numbers they deal with are increasing every year – in 2014 they took in 188 hedgehogs, more than double the number in the previous year. The hoglets need droplet feeding every four hours and the costs for maintaining this establishment are high. They are always looking for fund raising ideas or donations and have regular open days so people can call in and see the work they do. You can contact them via email: prickles.paws55@btinternet.com if you’d like to find out more, or find them on Facebook. Our two survived their journey home in their cardboard boxes and Dave and I released them at dusk into their new home with food and water close by. Ann seemed to think that Ronnie would move off quickly into the wild but little Joy would probably stay nearby while she found her feet in the big wide world. In Spring Dave was really excited to find a hedgehog on the Farmhouse lawn at dusk – it was the first live one we have seen in the grounds in the 17 years since we bought Bosinver,so our adopted rescue hogs have obviously settled and made Bosinver their home. 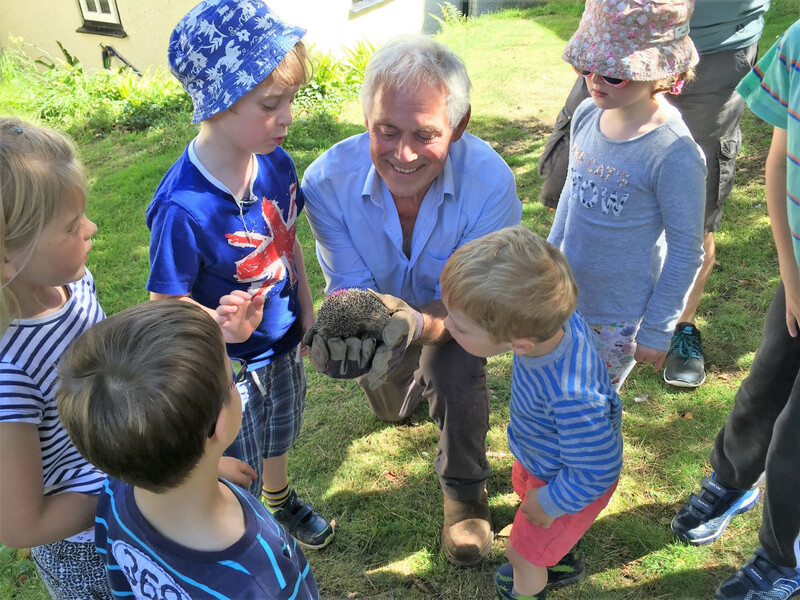 This week I went back to Prickles and Paws to collect 5 more, 3 male hoglets and 2 adult females which we released as part of our Wild Kids session to let the children have a close look at a live hedgehog and to suggest ways in which they might make their gardens at home more hedgehog friendly. 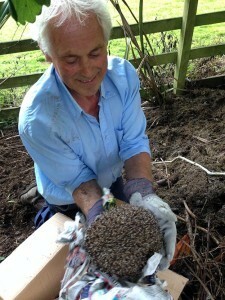 It was wonderful to see their faces light up as the hedgehogs uncurled and Farmer Dave (wearing gardening gloves!) held one up for closer inspection, and explained about their lives, that they are nocturnal, eat slugs and snails and other insects and that you can help them by leaving patches of wild garden for them to nest in, providing gaps in any fences so they can roam and forage for food, and by checking any bonfires before lighting. Hopefully we will have kindled an understanding and affinity with the creatures so the children and parents may take steps to help their hedgehogs at home. More importantly in today’s ever more manicured gardens, leave a corner to go wild with WEEDS (dare I say that?) and rough grass, which will provide hedgehogs with some shelter to site your logs or box. Gardens have become too tidy for them, paved over for parking or enclosed within impenetrable walls. Making small holes in fences or walls will allow them to move around freely in search of food or mates. Stop using pesticides, insecticides and slug pellets which are toxic. Let the hedgehogs eat the slugs and creepy crawlies instead! Check carefully before you strim around bushes and hedgerows or light bonfires. You can also become a hedgehog champion and take part in Hedgehog Street – a campaign to help support our prickly friends. You can find out more and download an information pack from the website. Another great source of info is Clive’s DIY garden “Ultimate guide to hedgehogs“, packed full of information about these wonderful creatures and how you can help them. Hedgehog numbers have plummeted by half since 2000 – let’s all try to do something to help them before it’s too late. Have you made a hedgehog house in your garden or spotted any hedgehogs lately? Post a comment below, tweet @bosinver or post on our Facebook page – we’d love to hear your hedgehog stories!